INTRODUCTION: Publications about and patents on liposomes, along with their different chemical components, preparation, and use in skincare products have often been reviewed [1-4]. The reviews do not need any additional comments. Of interest are general questions, such as why liposomes should be used in cosmetics, what functionalities are expected from them, and what advantages they do provide compared with alternative formulations. The properties of the widely used main component of liposomes, phosphatidylcholine, play a key role in answering these questions. Other compounds such as niotensides and ceramides, which are naturally predestined for the preparation of liposomes, are less important today. Niotensides do not offer superior claims, and ceramides are not available in sufficient quantities and qualities at affordable prices. Looking at the horny layer, which is the barrier against external materials, phospholipids and phosphatidylcholine, in particular play, a minor role. The lipid bilayers contain only traces of phospholipids, and the main components are free fatty acids, cholesterol, triglycerides, hydrocarbons and ceramides. But deeper in the living part of the epidermis, phosphatidylcholine is usually found as the most important constituent of all biological membranes, especially of plasma cell membranes. Over and above that, phosphatidylcholine is the source of phosphocholine to transform ceramides into sphingomyelins. 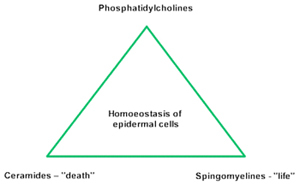 In this context, phosphatidylcholine stands for living tissues, whereas the increase of ceramides in the cells means that their death by apoptosis is imminent (Fig. 1). Figure 1 – omoeostasis of epidermal cells. Phosphatidylcholine of both human and vegetable origin shows a fatty acid composition, which is dominated by unsaturated fatty acids. The fatty acid content of soy phosphatidylcholine, which is readily available and mostly used in cosmetic formulas, is characterized by a proportion of linoleic acid up to 70% of the total fatty acids. Consequently, soy phosphatidylcholine has a very low phase-transition temperature of below 0oC in water-containing systems. This may be the reason behind its ability to fluidize the lipid bilayers of the horny layer, which can be determined by measuring the increase of the transepidermal water loss (TEWL) after application for a short while. The slight increase of TEWL coincides with the penetration of phosphatidylcholine and active agents, which are co-formulated with phosphatidylcholine. Because of its high content of linoleic acid and penetration capability, soy phosphatidylcholine delivers linoleic acid very effectively into the skin, resulting in antiacne properties . By adhering very strongly to surfaces containing proteins like keratin, phosphatidylcholine shows conditioning and softening effects, which have been known from the beginning of skincare products’ development. So, for example, shampoos were formulated in the past very often with egg yolk to soften hair und prevent it from becoming charged with static electricity. Egg yolk is very rich in lecithin. The main compound of egg lecithin is phosphatidylcholine. In a given mixture it is not relevant in which form the phosphatidylcholine is incorporated. However, when phosphatidylcholine is formulated, it is practically inevitable that bilayer-containing systems like liposomes will occur, because this is the most natural form of the material. For example, phosphatidylcholine swollen by water transforms spontaneously into liposomes when “disturbed” by little amounts of salts or water-soluble organic compounds like urea. In contrast, it has been known for a long time, that horny layer pretreated by phosphatidylcholine can be penetrated much more easily by nonencapsulated materials. So liposomes are not really needed to turn out the functionalities of phosphatidylcholine, but they are very convenient, because the handling of pure phosphatidylcholine requires a lot of experience and sometimes patience as well. In contrast, liposomes consisting of unsaturated phosphatidylcholine have to be used with caution in barrier creams because they do not strengthen the natural barrier function of the skin with an exception of its indirect effect of supporting the formation of ceramide I. Ceramide I is known for containing linoleic acid and for being one of the most important barrier-activating substances. Instead of unsaturated phosphatidylcholine, a fully hydrogenated phosphatidylcholine (Fig. 2) should be selected for products designed for skin protection. Hydrogenated phosphatidylcholine stabilizes the normal TEWL similarly to ceramides when the horny layer is attacked by hydrophilic or lipophilic chemicals . Table 1 shows a summary of the properties of unsaturated and hydrogenated phosphatidylcholine. Hydrogenated phosphatidylcholine is synonymous with hydrogenated soy phosphatidylcholine, which contains mainly stearic und palmitic acids and semisynthetic compounds like dipalmitoylphosphatidylcholine (DPPC) and distearoylphosphatidylcholine (DSPC). Because of their special properties it can make sense to combine unsaturated with saturated phosphatidylcholine in one and the same cosmetic or dermatological product. Abbrevations: TEWL, transepidermal water loss; CIR, Cosmetic Ingredient Review. Liposomes are spherical vesicles, whose membranes consist of one (unilamellar) or more (oligolamellar, multilamellar) bilayers of phosphatidylcholine. Sometimes, especially in patents, reference is made not about liposomes but about “vesicles with an internal aqueous phase”. The vesicles can differ in size (diameter about 15-3500 nm) and shape (single and fused particles). At a given chemical composition, these parameters strongly depend on the process of preparation. Very often the preparations are metastable. That means the state of free enthalpy is not in an equilibrium with the environment. As a result the vesicles change their lamellarity, size, size distribution, and shape with time. For example, small vesicles tend to form larger ones and large vesicles smaller ones. Fortunately this is mostly not critical for quality, because the properties of the phosphatidylcholine, which the vesicles are based on, remain unchanged as a rule. Nevertheless the stability seems to be the best in a range of about 100 – 300 nm. That is the case of pure aqueous dispersions of highly enriched (80 – 100%) soy phosphatidylcholine. In a complete formulation together with further ingredients, other influences like compatibility, concentration of salts, amphiphilics, and lipophilics play an important role. Therefore, it is often very difficult to prove the existence of liposomes, for example, in a gel phase or a creamy matrix. However, this is more a marketing problem than a problem of effectiveness of the formulation. Today, we can assume that the effectiveness of phosphatidylcholine is based more on the total chemical composition of the cosmetic product and less on the existence or non-existence of the added liposomes. This may seem curious, but it is in fact the reality. Of course, formulations are very effective in particular when consisting of pure liposomal dispersions bearing lipophilic additives in the membrane spheres and/or hydrophilics in the internal and external aqueous phases within the range of their bearing capacity. In this respect, there has been an intensive search to increase the encapsulation capacity of liposomes for lipids because consumers are used to applying lipid-rich creams. Efforts were made to add emulsifier to the liposomal dispersions to stabilize higher amounts of lipids. Formulators now know that the compatibility of liposomes with regard to emulsifiers is generally limited. In contrast, additional emulsifiers have a weakening effect on the barrier affinity of phosphatidylcholine. They cause the phosphatidylcholine and the lipids to be more easily removed from the skin while washing. In this respect there is only one rational consideration: to make use of nanoparticles (“nanoemulsions”, “nanodispersions”) consisting of phosphatidylcholine and lipids instead of liposomes. Nanoparticles are a consequence of the observation that oil droplets can fuse with liposomes, when the capacity of bilayers for lipids is exhausted . Further increasing the lipid/phosphatidylcholine ratio and using high-pressure homogenizers lead to nanoparticles. Nanoparticles consist of emulsion-like oil droplets surrounded by a monolayer of phosphatidylcholine. The advantage of nanoparticles is that they allow formulations to tolerate more lipids and remain stable. Also, additional emulsifiers are not needed. Liposomal dispersions based on unsaturated phosphatidylcholine lack in stability against oxidation. Like linoleic esters and linoleic glycerides, these dispersions have to be stabilized by antioxidants. By thinking naturally, a complex of vitamins C and E (respectively, their derivatives like acetates and palmitates) can be used with success. In some cases phosphatidylcholine and urea seem to stabilize each other [9,10]. Moreover, agents that are able to mask traces of radical-forming ions of heavy metals, like iron, can be added. Such additives are chelators like citrates, phosphonates, or ethylene diamine tetraacetic acid (EDTA). Alternatively, the unsaturated phosphatidylcholine can be substituted by a saturated one like DPPC or hydrogenated soy phosphatidylcholine, which should be favored for its price. Because of the higher phase-transition temperature, liposomal dispersions based on hydrogenated material are more sophisticated in their preparation and are reserved for pharmacological applications as a rule. An interesting new development in the field of cosmetic compositions with hydrogenated soy phosphatidylcholine is the derma membrane structure (DMS) technology . DMS stands for cream bases (technically the creams are gels) containing hydrogenated soy phosphatidylcholine, sebum-compatible medium chain triglycerides (MCT), shea butter and squalane. 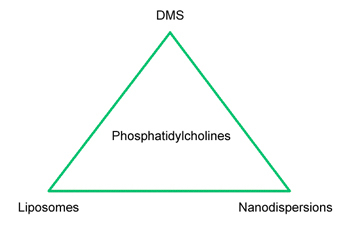 In addition to liposomal dispersions and nanoparticles, DMS is a third way to formulate phosphatidylcholine with hydrophilic and lipophilic compounds free of further emulsifiers (Fig. 3). DMS is water- and sweat proof and therefore suitable for skin protection and sun creams without using silicones or mineral oil additives. It can easily be transformed into other final products by stirring at room temperature together with liquid lipids and/or aqueous phases. Figure 3 – Formulations with phosphatidylcholine free of further emulsifiers. Abbreviation: DMS, derma membrane structure. As previously mentioned, DMS is predestined for skin protection, but by addition of nanoparticles and/or liposomal dispersions it can easily be enriched by unsaturated phosphatidylcholine containing esterified linoleic acid. The resulting products are creamy, stable, and anticomedogenic. The effect of pure DMS basic creams on skin moisturizing, smoothing and tightening are still significant several days after finishing the application. Liposomes, Nanoparticles and DMS have to be preserved. This may be a problem, because phosphatidylcholine (lecithin) inactivates most of the conventional preservatives . In contrast, preservatives should not be penetrated in the skin to prevent irritation and sensitization. Therefore, glycols like propyleneglycol, glycerol, butyleneglycol, pentyleneglycol, hexyleneglycol, sorbitol and their mixtures are the compounds of choice. In contrast to ethanol, which can also be applied up to certain extent, these polyols show a moisturizing effect at the same time. One of the reasons to substitute phosphatidylcholine by polyglycerols and other synthetic derivatives at the beginning of the liposomal developments was its hydrolytic instability in aqueous preparations for longer periods of time and at higher temperatures. In fact phosphatidylcholine, like other glycerides, is attacked by water to form lysophosphatidylcholine and free fatty acids. But the cleavage of the glyceride bond occurs mainly at a pH > 7; so formulations in the range of pH 5,5 – 7 are sufficiently stable for most purposes. It is possible that hydrolysis depends on the amount of additional surface active compounds. This is another reason to use liposomal dispersions without additional emulsifiers. As previously mentioned, liposomal dispersions are a very comfortable method to use to work phosphatidylcholine into cosmetic formulations to obtain its superior spectrum of multifunctionality. 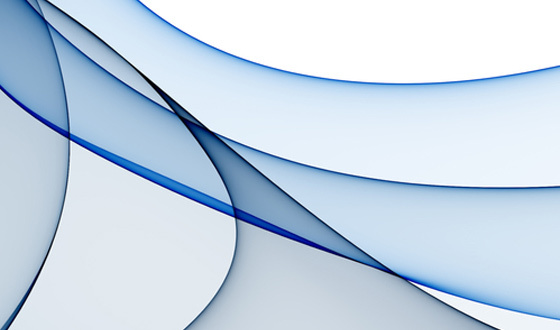 Preliposomal fluid phases up to 20% phosphatidylcholine and more are commercially available . Also, there are references to the use of instant liposomes in combination with carbohydrates as dry powders . An interesting consideration is bath oils, which form in situ liposomal dispersions free of additional emulsifiers . These compositions are based on mixtures of phosphatidylcholine, triglycerides and alcohol. By pouring the mixtures into water, liposomal particles are spontaneously formed. These particles strongly tend to adhere to the skin surface and benefit dehydrated and sensitive skin. Numerous other methods for preparing liposomes have been described . Today, most of the experts working in the field of liposomal dispersions agree that liposomes do not penetrate as intact vesicles into the skin or permeate through the skin. Liposomes are believed to be deformed and transformed into fragments as a rule. Therefore size, shape, and lamallarity are not so relevant for the application, but for the chemical composition of the total formulation. The multifunctional properties of phosphatidylcholines lead to a number of different applications. So, formulations with unsaturated phosphatidylcholine are preferred to support skin regeneration, antiaging, acne preventing, and penetrating other active agents like vitamins and their derivatives into the skin. Formulations with hydrogenated phosphatidylcholine may be used for skin and sun protection, but it should be emphasized that in this respect nanoparticles and DMS are still more convenient. 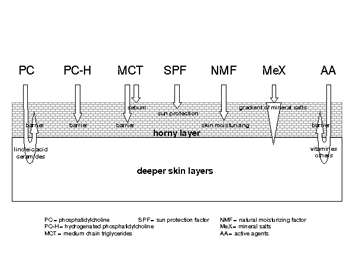 The main components of choice to prepare “natural” formulations, which are compatible with horny layer, sebum constituents and their functions, are illustrated in Figure 4. Details about the role of mineral salts can be found in Ref. .
Liposomal dispersions have proved not only to be innovative and effective cosmetic ingredients, but also to be a very convenient form to work with phosphatidylcholine. In dermatology, they will be used with success for preventing and treating several skin diseases. Complementary formulations are established where liposomal dispersions come up against limiting factors. Table 2 shows liposomal and complementary formulations in a direct comparison. Generally, members of the membrane family like liposomes, nanoparticles, and DMS are more compatible with the skin structure than usually applied conventional emulsions. “Compatible” means that formulations do not disturb the integrity of the skin lipid bilayers and are not washed out when the skin is cleaned. In the sense of modern strategies of cosmetics, these formulations get by with a minimum of auxiliary compounds, which put only a strain on the skin. Moreover, compatibility means embedding lipids and hydrophilic agents in the horny layer and being in line with the natural situation. Remarkably, phosphatidylcholine need not be applied in high concentrations, because experience shows that formulations are stable at lower amounts. Also, there is a cumulative effect in the horny layer with repeated application of phosphatidylcholine. In many cases liposomes, nanoparticles and DMS are compatible with each other in a sense that they can be used as a modular system. So these formulations are believed to still have a great future in cosmetic science. How far new findings about the importance of the choline moiety of phosphatidylcholine  will impact skincare research and development cannot be estimated today. Lasic DD. Liposomes and niosomes. In: Rieger MM, Rhein LD, eds. Surfactants in Cosmetics. 2d ed. New York: Marcel Dekker, 1997:263-283. Wendel A. Lecithins, phospholipids, liposomes in cosmetics, dermatology and in washing and cleansing preparations. Augsburg: Verlag fuer chemische Industrie, 1994. Wendel A. Lecithins, phospholipids, liposomes in cosmetics, dermatology and in washing and cleansing preparations Part II. Augsburg: Verlag fuer chemische Industrie, 1997. Braun-Falco O, Korting HC, Maibach HI, eds. Liposome Dermatics. Berlin: Springer-Verlag, 1992. Ghyczy M, Nissen H-P, Biltz H. The treatment of acne vulgaris by phosphatidylcholine from soybeans, with a high content of linoleic acid. J Appl Cosmetol 1996; 14:137-145. Lautenschlaeger H. Kuehlschmierstoffe und Hautschutz – neue Perspektiven. Mineraloeltechnik 1998 (5):1-16. Cosmetic Ingredient Review. Lecithin and Hydrogenated Lecithin. Washington: The Cosmetic, Toiletry, and Fragrance Association, 1996. Lautenschlaeger H. Liposomes in dermatological preparations Part II. Cosmet Toilet 1990; 105 (7):63-72. Nippon Surfactant Kogyo KK, Japanese Patent 199104364104 (1992). Lautenschlaeger, German Patent 4021082 (1990). Kutz G. Galenische Charakterisierung ausgewaehlter Hautpflegeprodukte. Pharmazeutische Zeitung 1997; 142 (45):4015-4019. Wallhaeusser KH. Praxis der Sterilisation, Desinfektion – Konservierung. 5th ed. Stuttgart: Georg Thieme Verlag, 1995:43, 394. Roeding J. Properties and characterisation of pre-liposome systems. In Braun-Falco O, Korting HC, Maibach HI, eds. Liposome Dermatics. Berlin: Springer-Verlag, 1992:110-117. Lautenschlaeger, German Patent 4021083 (1990). Feingold KR. Permeability barrier homoeostasis: Its biochemical basis and regulation. Cosmet Toilet 1997; 112 (7):49-59. Blusztajn JK. Choline, a vital amine. Science 1998; 281:794-795.